The retina is an extension of the brain. It forms the interior lining of the eye and contains millions of light-sensitive nerve endings. The light rays that enter the eye pass though the cornea, pupil, lens, and vitreous ultimately focusing on the retina. The retina then perceives the light and transmits nerve impulses through the optic nerve to the brain, where a visual image is created. Vitreous is a clear, gel-like substance that fills the cavity between the lens and the retina. Vitreo-Retinal (VR) surgery is a branch of ophthalmology that deals with the surgical management of vitreous and retinal diseases of the eye. 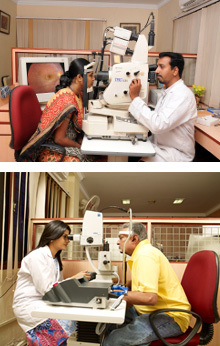 Vitreo-Retinal consultants should be your first choice when looking for experienced ophthalmologists who specialize in diagnosing and treating vitreous, retinal, and macular eye diseases.